I am the Editor-in-Chief of Author magazine, a writer, and a lecturer. Whether it's fiction or non-fiction, interviewing or speaking to groups, I am always interested in the intersection of creativity and everyday life. Everyone is the author of their own life; some of us write that life with a pen. 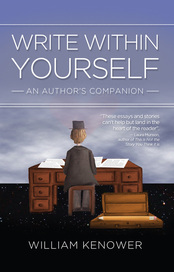 WRITE WITHIN YOURSELF: An Author's Companion is now available. This collection of essays and stories have been compiled to remind writers and all creative people why we must make the things we love to make. Thanks for stopping by. My virtual door is open. Where would you like to go?